Arches released a new product a few years ago just for oil painters: Arches Oil Paper! Sized for oils and ready to go, Arches Oil Paper is an indispensable surface for anyone dabbling or proficient in oil painting. It takes well to oil pastels, too. Pads come in 9″x12″ or 12″x16″ sizes, with 12 sheets per pad. I’ve added two sizes of pads to the online shop. I like to tape them down to a piece of foam-core that is slightly larger than the paper. It is also very convenient to be able to cut or rip the Arches Oil Paper into smaller “tester” sized pieces. The paper is available in 22″x30″ sheets as well – special order only at this time. Copic Sketch Markers have been added to the shop! Currently I have 64 colors available for purchase at $6.49 each. If you live in Calgary, local pick-up is free. Copic Sketch Markers are dual ended alcohol based markers manufactured in Japan. They are available in 358 colors and one colorless blender. Made in Japan. Used widely by graphic designers, artists, crafters and anyone else who loves sketching! We are currently working on getting our online store up and running. Customers will be able to purchase original artwork, art supplies and some picture framing supplies via the shop. Stay tuned! SKETCH Art Supplies on eBay Canada! 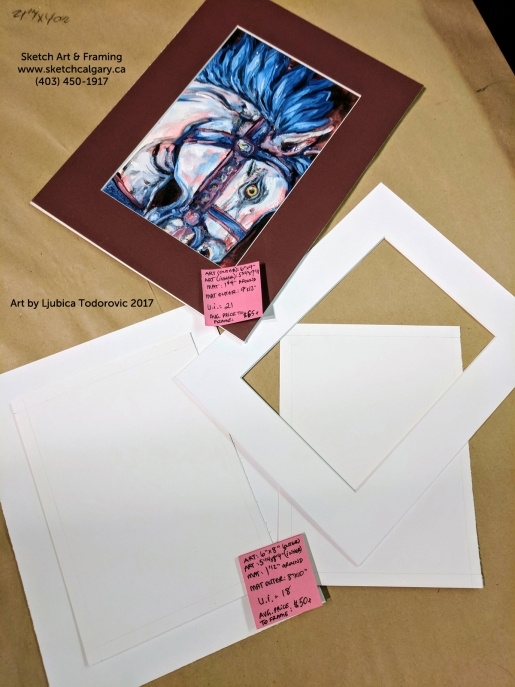 I, Luba, will be at the Calgary Comic & Entertainment Expo as a Creator Guest, booth P61 in the Artist’s Alley Round Up Center, Stampede Park. Event goes from April 26 – April 29, 2018. Come see me for bunnies and picture framing coupons! I will have plenty of original artwork, prints and magnets for sale. Big Bertha, my Epson 9900, was put to very good use for this show. Coupons are good for framing jobs as well. See you there! A good tip for artists wanting to save a bit of money on framing costs: planning your artwork sizes and margins eliminates matting issues for yourself and/or future customers who buy your work. It doesn’t take long and will save money when the need to mat or frame your artwork arises. This is particularly true for artists who create daily paintings on paper and wishes to mat/back/bag them for sale after the work is complete. I will give two example price outcomes in this post; one will be an already completed artwork which fits into a 9″x12″ mat, and the other is a planned artwork which will fit into an 8″x10″ mat. The price difference to frame these works is approximately $15, which can add up if an artist is planning on creating a large amount of work. Sketch Art & Framing is a custom picture framing workshop and art studio operating out of Calgary, Alberta Canada. I offer custom picture framing and digital fine art printing (by appointment). It is run by a sole proprietor and artist – me – Ljubica (Luba) Todorovic. I previously operated via brick & mortar shop, first as Studio Todorovic (3 years) and later Sketch Art Supplies (5 years) and decided to cut costs by ending my commercial lease in May 2016. I now work from home in Huntington Hills, Calgary Alberta. Please call first before visiting so that I can book you in for a visit, consultation or drop-off! Hope to see you soon! Please call for address and to book a visit. By appointment only at this time. Typically open & answering the telephone Monday-Saturday, 10 am to 5 pm. Saturdays, Sundays and Holidays are by random hours only.